The ISM manufacturing index for July is pretty much in line with market expectations – the headline dropping from 57.8 to 56.3 (consensus 56.4). All the major components fell by 2-3 points, but they are at healthy levels (production and new orders both above 60). Employment is at 55.2, exactly in line with the sixth-month average so suggests ongoing good jobs growth in the manufacturing sector. To underline the decent performance the headline index (despite today’s dip) is at levels historically consistent with GDP growth of around 4%. Meanwhile, the Prices Paid component rose seven points to 62.0, leaving it broadly in line with its six-month moving average. This is well above the 50 break-even level so while there is an absence of inflation pressures at the consumer level, both this report and to a certain extent the PPI report suggest that there are some pipeline inflation pressures starting to materialise. A 10% fall in the dollar since January may also start to generate some inflation, but with wage growth remaining lacklustre the market continues to doubt the prospect of meaningful rate rises from the Federal Reserve. 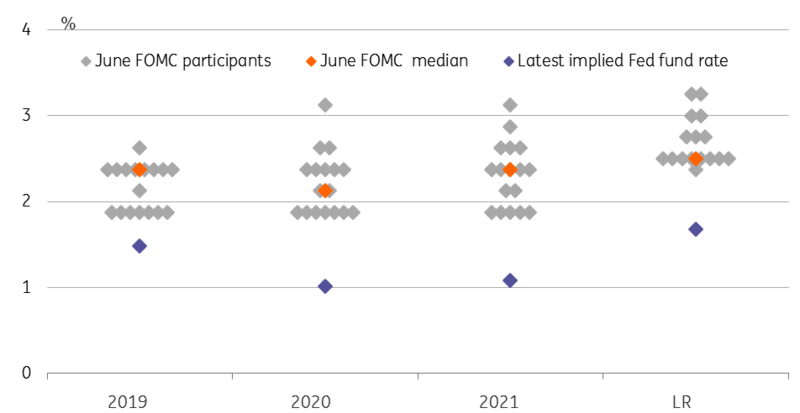 While we agree that four rate rises (which were the projections in the June FOMC forecasts) may be a little aggressive, we think the market is being too complacent in only barely pricing in one 25bp hike over the next 18 months. We look for a December rate hike followed by two more next year.